Father's Day is almost upon us again (Funny - seems like just a year ago we celebrated our dads and the other significant men in our lives doesn't it?). As you know, duct tape is the most popular Dad tool - especially for those dads who are not exactly what you'd call "mechanically inclined." In fact, the less you know, the more you need duct tape (maybe that's why Jim is so into duct tape). 10. Remote Control Control: Duct tape the remote onto Dad’s arm so he never has to relinquish remote control use to the wife and kids. 9. Keep the junk mail and bills away by duct taping the mail box shut. 8. A gift necktie made entirely out of duct tape is not only a nifty fashion statement, but also resists stains from Dad’s spilling problem like the dickens! 7. Lower Dad’s receding hairline by applying a strip of duct tape from the forehead to the underside of chin.When Dad open’s his mouth it will pull that hairline right back down into place. 6. Dad’s hairline recession on it’s way down the BACK side of his head? Simply fashion a duct tape toupee and tape it onto Dad’s dome. He’ll be able to swim in it, play tennis in it, even bowl in it with complete confidence! 5. Cover Dad’s golf club head with duct tapethe impression that the ball makes in the tape will show him why he keeps getting that nasty hook or slice. 4. Soak strips of beef in marinade, then stick the strips of meat on a piece of duct tape hanging over the kitchen sink (to catch the drips) until it air dries into a tasty beef jerky for Dad to enjoy at his next poker party. 2. Another Bald Dad Hint: If Dad misses that fly-away hair look, duct tape a couple of pigeons to his head. 1. Duct Tape the toilet seat UP! 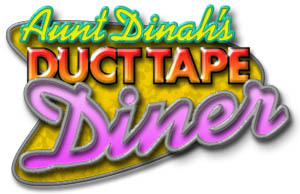 Keeping Your Personal Economy Stimulated For those of you who might have missed last month's newsletter, here is a reminder to review our Duct Tape Economic Stimulus Package on a Roll page. Thanks. The Duck brand Stuck at Prom contest for 2009 is winding down... The contest ends June 8th. BE A PART OF IT! GO VOTE! Online voting happens between June 19th and July 2nd. Winners will be announced July 9th. Want more info? 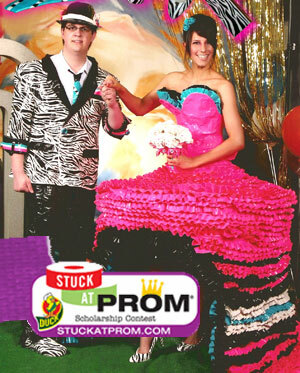 CLICK TO: StuckAtProm.com - browse through our massive collection of prom gowns and tuxes here. Is Duct Tape BAD just because it's sometimes used in crimes? 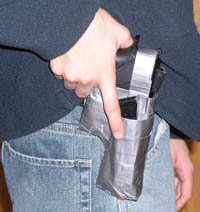 Much to our dismay, we're often "informed" of crimes that have been committed using duct tape. But is this any reason to give duct tape a bad rap (wrap)? Heck, no! Even a hand egg beater in the wrong hands can be a dangerous weapon! We've documented some of the instances of "Duct Tape Gone Wrong" on a special page that we aren't all that proud of, but, the truth needs to be told - and, like Fox News, we aim to be "Fair and Balanced" (although we usually end up being fairly imbalanced - thanks in no small part to the beer we consume). 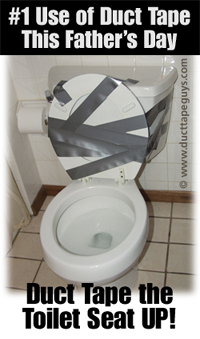 Take a look at Duct Tape Gone Wrong - and learn what you should NOT use duct tape for. 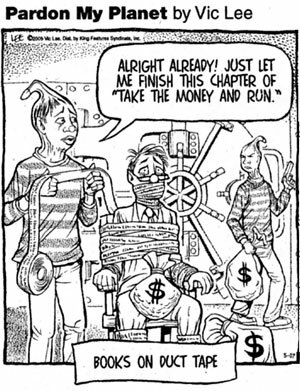 The cartoon on he left is by Vic Lee - thanks for the inadvertant plug of our books, Vic! You can see other duct tape cartoons here. We moved our stores to Octane Street. In an effort to update our stores and get them to a place where more people can find them, we moved them to Octane Street. Here you can still purchase our books (in the bookstore) and Duct Tape apparel (in the Humor Apparel Store). There's also a storefront for the Duct Tape Guys. Check it out and click around Octane Street - you just might discover some other humorous creations from Tim and company while you are there. Got a Duct Tape Story to Tell? 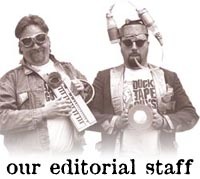 Send us your duct tape stories and photos and we may feature them on our web site, in an upcoming newsletter, and/or in one of our upcoming books and calendars. All you have to do is click to the SUBMIT page - there are full instructions awaiting you there. I stopped at a truckstop called Johnson's Corner the other night. On the comment card it asked, "If you owned Johnson's Corner, what would you do differently?" I said, "I would eat here for free!" 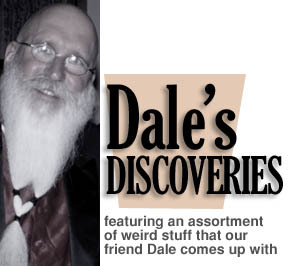 Later I realized that I would probably also change the name to "Dale's Corner". - Thanks to Marlene B. When you see paintings of angels in heaven, how come none of the prophets from the Old Testament are ever playing the Jew's Harp? I bought some edible underwear the other day. I threw my back out trying to eat them. I guess maybe you are supposed to take them off first. - Thanks to David D.
Before you build a building you break ground. Before you build an airport, do you break wind? What did they call the "Deer in the Headlights" look before cars were invented? Fred Flintstone worked in a rock quarry driving a dinosaur. How come he needed to wear a tie? In fact, that one outfit is all he ever seemed to wear. The only other time he wore something different was to go to the Water Buffalo lodge. I wonder if he realized that buying that outfit would essentially double his wardrobe. MulletLikeMe.com - remember the Mullet? It's back! 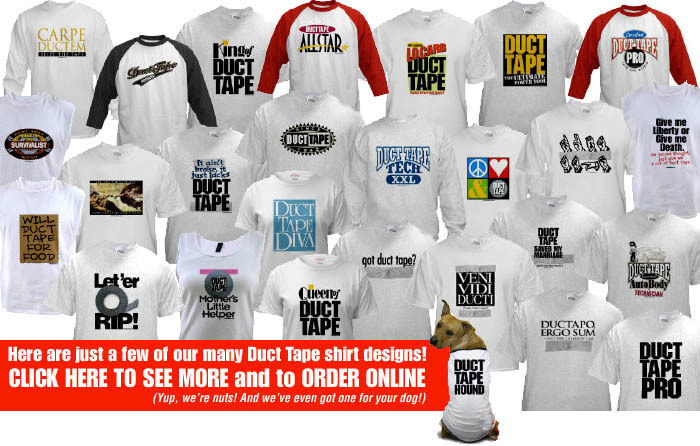 Read this humorous blog by someone very near and dear to the Duct Tape Guys' hearts. 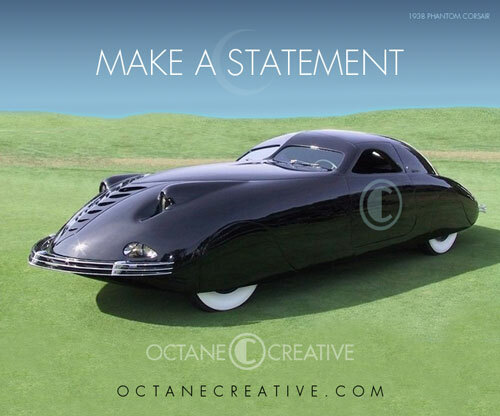 And, speaking of odd cars, check out the Octane Garage - Tim's collection of weird cars (no he doesn't own them, he just looks for "different" vehicles, runs them through his powerful Photoshop bodyshop for a new paint job and parks them in his virtual garage. The results are intesting... like the one shown below. Glove Repair in India I am from the US, but I teach at a school in rural in India, and the wildlife (snakes, scorpions on the exciting side, lizards and rats on the not-so-exciting side) tend to co-habitate with us. So I returned from my summer off to find about $500 of my best outdoor gear eaten to shreds by a rat (one of my students found the rat, decomposing, in one of her best sweaters...who got the worse deal?). Anyway, one of my gloves was almost completely demolished, as well as a wool sweater. So I cut up the sweater, put it inside the glove, and duct taped it in! 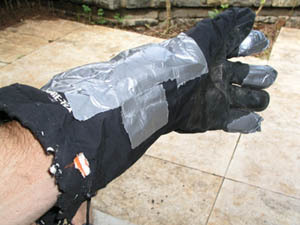 The result -- one glove that was way too warm on my backpacking trip in the Himalayas in November! Shake it Up! I had 2 cans of spray paint that needed to be shaken so I duct taped them to the wheels of my self-propelled mower started it up raised the wheels off the ground and Voila! Paint mixed with no effort. - Richard S.
Barb's Inspired Uses: My mother-in-law knits slippers for us. They have a yarn bottom, so they wear out in about six months from walking on them. So I always put duct tape on the bottom of my slippers, to act as a "sole" and have had my slippers for years!! Be careful, they are very slippery, so if you go outside and it's wet, or icy, the slippers will act as ice skates. Also, we have a Yellow Lab dog who jumps off our pontoon boat, and climbs up the people ladder. She loves to jump into the water to retrieve her tennis ball. We had to get a new ladder this year, and the rungs were very wide going up the ladder. We were afraid that our dog would slip through the sides of the new ladder and hurt herself. Therefore, we used duct tape to wind around the ladder sides, and it worked!! The duct tape can last all summer long, without being replaced. Last, but not least, one of my friends at work had her bra strap break, and was looking for a safety pin. Nobody had one, but jokingly I said, "How about a piece of duct tape until you get home?" Sure enough, it worked, and we still laugh about it!! Thanks for a great calendar! - Barb McE. 1.Her face was a perfect oval, like a circle that had its two sides gently compressed by a Thigh Master. 2. His thoughts tumbled in his head, making and breaking alliances like underpants i n a dryer without Cling Free. 4. She grew on him like she was a colony of E. Coli, and he was room-temperature Canadian beef. 8.The revelation that his marriage of 30 years had disintegrated because of his wife’s infidelity came as a rude shock, like a surcharge at a formerly surcharge-free ATM machine. 12.Her hair glistened in the rain like a nose hair after a sneeze. 13.The hailstones leaped from the pavement, just like maggots when you fry them in hot grease. 17.He fell for her like his heart was a mob informant, and she was the East River. 18.Even in his last years, Granddad had a mind like a steel trap, only one that had been left out so long, it had rusted shut. 21.The young fighter had a hungry look, the kind you get from not eating for a while..
24.It was an American tradition, like fathers chasing kids around with power tools.